Lee Hayden (Sam Elliott), is in a personal and professional slump when he learns that he has terminal cancer. Instead of talking about his news with loved ones, he goes to get high with his drug dealer, and fellow washed up actor Jeremy (Nick Offerman). Thus we learn that not only is Lee Hayden washed up, he is washed out of the lives of his family. 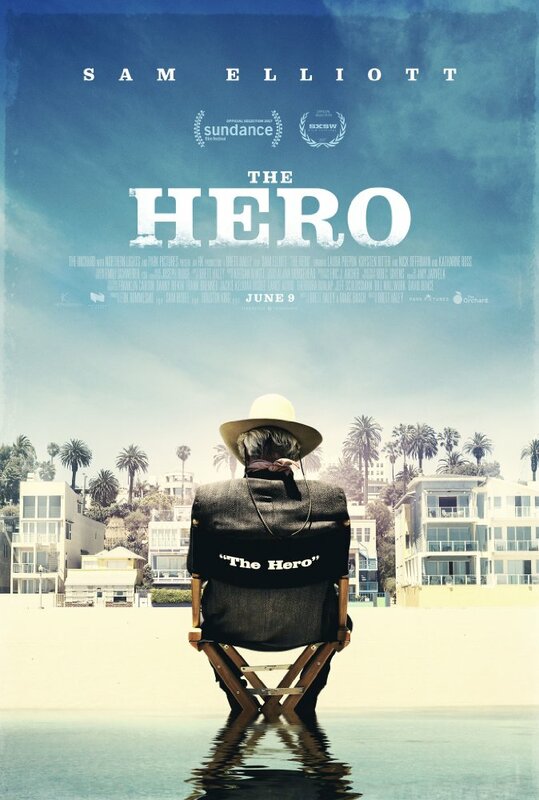 Lee’s sole moment of glory came when he was in a Western film also called The Hero. Weighted down with his health news he stays high to avoid reality and dreams of himself living as his film persona. Elliott’s nuanced performance is sure to get the attention it deserves, it’s a shame that the film isn’t more memorable or special. Some of the interactions between Lee and Jeremy are mildly entertaining, but the relationship between Lee and Charlotte (Laura Prepon) is more preposterous than Lee’s fantasy of living as his best role. Not only is Charlotte crass and rude, shes about the age of his daughter. She openly insults him on-stage, and explains that she’s interested in him, “because she has a thing for much older men.” There is zero chemistry between the two performers and when Charlotte awkwardly quoted Edna St. Vincent Millay I wished that I had a book to throw at the screen. Millay comes up again in the film in the most clichéd and predictable ways possible. The writers took a disappointing easy path that we’ve seen before. Is there a new story to tell about a rich. entitled, old man who has been a terrible husband and father and now might feel a tiny bit regretful about it? Maybe, but this is not it.